No idea if this has been shared before on the forum and I apologise if it has! 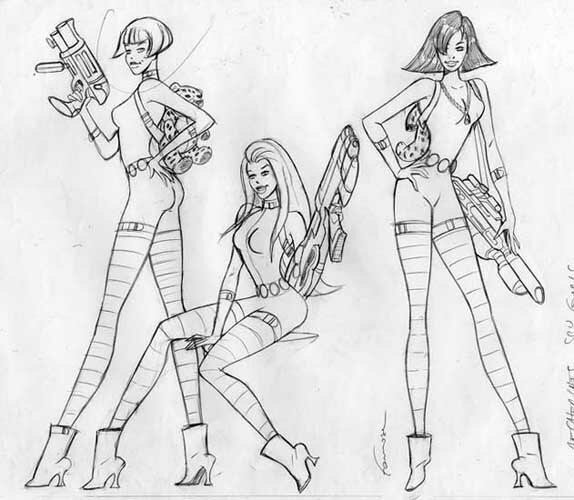 Recently came across the original character designs for Totally Spies by Gil Formosa. First time seeing these and thought it’s worth sharing, would love to know what others think of these concepts. 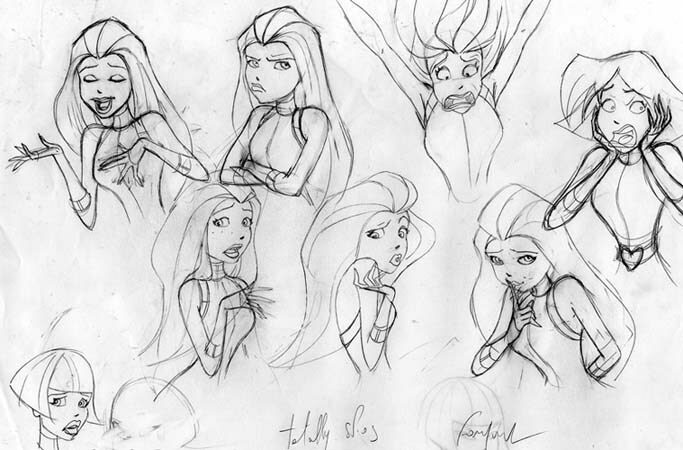 “Some of my different stages for the creation of the 3 girls of the animated series Totally Spies. This concept to me shouts “Bond girl” but obviously more than one Bond girl here haha. It almost has a sci-fi feel, maybe it’s the silver guns and Sam’s white/silverly catsuit? Alex’s hair is super different! Interesting to see Clover’s hairstyle is pretty similar to her final design. I feel like I’ve seen this artstyle before on another 90s TV show but I can’t seem to pinpoint it. Something from the Pepper Ann or Doug era?? Anybody know what I’m chatting about? It’s very 90s highschool style, I like it! That's a great find. I haven't seen these before. The first one definitely has a 60s sci-fi feel. No surprise Clover looks better in black, and I also like the garter-esque equipment on her thigh and the fingerless gloves they all have. Then there are those rather deadly looking firearms. Sam seems to have a rifle, Clover a shotgun, and Alex a grenade launcher. Those would match their personalities - precise, blunt, and just don't piss her off, respectively. I also see both Alex and Clover have stuffed animals. That almost seems meant as a counterpoint to the otherwise rather adult tone of the image. Clover's personality seems to have taken shape early. I wonder if he had input into their personalities or if he was just given guidelines by Marathon? Maybe we could ask him. This B&W version is even more suggestive (all three have larger or more clearly outlined chests). Wow, I've not seen these before either. Thanks very much. And great insights by hdc. The art is fantastic, and that first one Yeah, they're definitely looking older. Really interesting how much it changed. The model sheets of action/expression are incredible. Also curious about this pilot and caucasian Alex. I should see if can find it on YouTube. I've never managed to find it, but that definitely shouldn't discourage anyone else from looking. One possibility would be to comment on the clips that have been posted to Youtube and ask where they're from. It has a page on the TS wiki but that doesn't really tell us anything. "The original plans for Totally Spies were a lot more ambitious than what ended up on screen when the show debuted in 2001. It was going to be a reality series, in which young women would compete to be part of a tween-friendly all-girl pop band, which would then release an album and go on tour, with an animated series based on their adventures. The cartoon is the only part that came to any real fruition." Not sure what their source is, but I'd say things worked out for the best. Also, there was a video game with some similarities to TS, No One Lives Forever, released in 2000. It's a first-person stealth/shooter about a female British agent who works for a WOOHP-like organization during the Cold War and uses gadgets disguised as fashion accessories. It's sadly forgotten today, but it won several Game of the Year awards. I've always wondered if the TS creators drew any inspiration from it. I did find a clip on YouTube- but not the whole thing. And forgot once again how to post thumbnails. I remember there being a tour of some kind in Europe, and maybe some stops in Asia (I remember reading about a mall performance). It may have been with different people though than the band in that link (who released a single I think). There's no record of any of this in English because it never came to the US. Totally Spies was a much bigger thing in French speaking Europe in regards to merchandise and tie-ins. It sort of looks like a leggier version of Braceface or Lizze McGuire or something. lol Although, it also evokes older character design styles from the 60's and 70's I think, which may go with the groovy retro theme of the show when it started. During the late 90's/early 2000's, stuff with faux-60's/70's aesthetic was back in style again. The show also borrows from Charlie's Angels. I'm pretty sure Kim Possible was patterned after Sam. This was back when Disney was trying to copy what everyone else was doing in cartoons as some kind of attempt to control the market. Like there would be a quasi-Asian action show for kids, and then Disney would roll out their own take on the premise a few months later. I'm pretty convinced this was the same thing with Kim Possible, and the fact it replaced Totally Spies in its time slot on one cable station helps to underline that. Yeah, I remember reading that guide a long time ago & forgot how to do it. Also where (which subsection) the info was on how to. So BB tags are what I found in 'Insert Special Item' I'm thinking. And the last part of the YT link. Great. And a band called Totally Spies- quite the find! No sign of them on YouTube. But doing that to TS is so bad. Anyway, great original design concepts! I'm surprised you guys haven't seen this before! Actually came across the coloured mature concept drawing on Instagram, it was from a "throwback 90s cartoon" account (I'm pretty sure their display picture was an image of Mandy ). Originally thought it some unique looking fanart and came across the artist's name, did a little research and here we are! Loving everyone's input and observations here, I'm learning some more interesting facts too. Would LOVE to see the pilot episode if it's out there, Sam looks adorable with her beret in the pilot snippet. Also had no idea there was a TS band, the french-speaking European countries are lucky with all the extra TS content they had! @hdc, Some very detailed responses on the mature concept, nothing gets past you Contacting the artist is something we could definitely do! @jettmanas, nice job finding the pilot clip! It's so cool to see the difference between the pilot and final animation. Somehow, I knew you were thinking of Lizzie McGuire even though I listed Braceface first. In fact, I don't think the character designs are that close and Lizzie McGuire is from the 2000's. XD But I guess I am a bit psychic and read your mind. Haha. I'm surprised you guys haven't seen this before! Actually came across the coloured mature concept drawing on Instagram, it was from a "throwback 90s cartoon" account (I'm pretty sure their display picture was an image of Mandy laugh.gif). Originally thought it some unique looking fanart and came across the artist's name, did a little research and here we are! Doesn't look like music to me. Putting into the translator, it says it's a "radio play." I guess sort of like those ones for cartoons they used to release on cassettes way back when or the radio plays they still release for anime now. It could also be a Video CD, aka a VCD, which was an aborted home video format that put VHS quality video on CDs. I think you're right, here are more, and some are indeed available on cassette (2, 3, 4). At random, a cute pose of Clover leaning on Sam. I'll try to find a better/clearer version. You are definitely a mind reader, that or you know me so well already And yeah, looking at the images together they don't actually look that similar whoops! These are some awesome finds! That backpack is an art form in itself The colours, the shape, the "Will Spy For Sushi" text and the glorious image of them together - How can I possess such a magnificent bag?